In brief, Stanley William Clarke was businessman and racecourse owner. 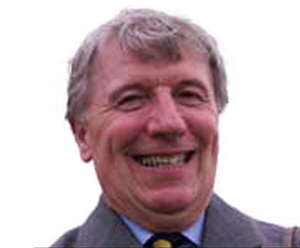 Born in Burton upon Trent from a fairly humble background, he rose to become chairman and president of St Modwen Properties plc and was a founder and chairman of Northern Racing. He was appointed CBE in 1990 and knighted in 2001. Stanley was born in Woods Lane, Stapenhill in 1933. 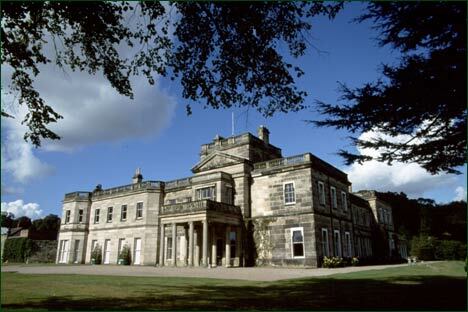 His father suffered from ill-health with long periods out of work, his mother, Mabel, worked in service at Dunstall Hall. Young Stanley contributed to the family by delivering newspapers as well as meat for a local butcher. After attending Burton Technical College, he started work as an apprentice plumber. During his twenties, he purchased a plot of land for £125 but sold it before long for £650. His business empire had begun! After getting married to his wife Hilda, Stanley formed a building company with his brother-in-law, Jim Leavesey. The company became Clarke Quality Homes and grew radidly to become one of the largest house builders in the Midlands. The house building company was eventually sold to Balfour Beatty in 1986 leaving him to concentrate on his other company, St Modwen Properties Ltd (later St Modwen Properties plc), which took on much larger developments which included Burton’s Octagon Shopping Centre, Stoke-on-Trent’s Festival Park, Britannia Stadium and regeneration of Trentham Gardens. His success allowed him indulge his life long love of horse racing but, unlike most who have to content themselves with buying a racehorse, in 1988 at age 55, he bought Uttoxeter Racecourse! Though the course was struggling at the time, it was quickly transformed under Clarke’s ownership. He gave each of his courses a distinctive green and white livery as part of a re-branding that concentrated on quality. Stanley Clarke was not a man easily missed. Broad of frame and of smile, he made a huge impact on British racing by buying up eight further racecourses and applying at all of them the simple policy: giving the customers what they want. He always enthusiastically encourage feedback from people at his racecourses whether it be by walking around with a name-badge on his jacket or distributing ”How are we doing?” questionnaires. Clarke’s racecourses portfolio included – Bath, Brighton, Chepstow, Yarmouth, Fontwell, Hereford, Newcastle, Sedgefield, and of course, Uttoxeter – and was instrumental in creating a more aggressive, commercial approach among courses. His acquisition of Brighton was a particular success. The seaside course had become run-down and in decline, but Clarke’s pizazz saw it restored virtually to former glories. 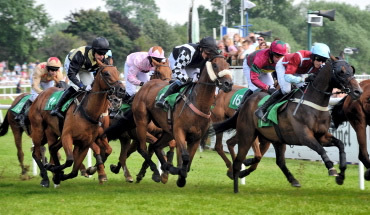 The courses eventually became ‘Northern Racing group’, and was one of the first racecourse groups to negotiate directly with the bookmaking industry to secure a deal for transmitting pictures from those tracks to Britain’s betting shops and beyond. 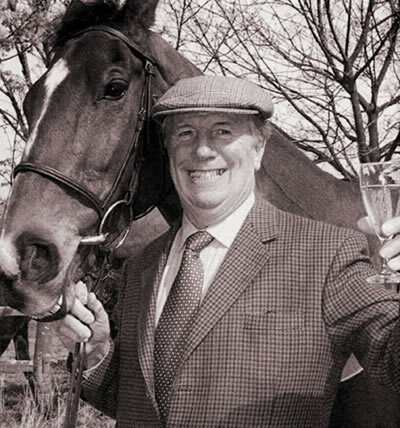 Clarke’s involvement in racing extended beyond ownership of nine courses; he was also a successful racehorse owner and held a permit to train. In his younger days, he and his wife, had featured prominently on the point-to-point circuit, with good horses such as Mount Argus and Captain Frisk. As always, what he touched turned to Gold and in 1997, he realised one of his highest ambitions and won the Grand National with his horse Lord Gyllene. Each Grand National seems to come up with headline news, but that year, more so than ever. It took place on a Monday, having been delayed by 48 hours by a bomb scare. Amid a festival atmosphere, of a type Clarke was always trying to engender at his courses, Lord Gyllene was ridden by Tony Dobbin to a runaway victory. The New Zealand-bred gelding was one of a succession of high-class jumpers to run in Clarke’s black-and-white-striped colours. Barton won the 1999 Royal & Sun Alliance Novices’ Hurdle at the Cheltenham Festival, and is one of a few horses to defeat the triple Cheltenham Gold Cup winner Best Mate. Another Cheltenham Festival winner was Rolling Ball, who also won over the Aintree fences but is best known for victory in the 1991 Royal & Sun Alliance Chase on only his second start over fences. So excited was Mrs Clarke by the success that she fainted afterwards in the winner’s enclosure. Another quality Clarke horse was Lord Relic, who won the 1993 Challow Hurdle at Newbury by 10 lengths. Stanley Clarke was also a member of the Jockey Club and served as a board member of the Racecourse Association for over 10 years. Sir Stanley’s legacy is also that he is remembered through the millions of pounds he gave to or raised for wide ranging charities. These included Lichfield Cathedral, Queen’s Hospital Cancer Appeal, Racing Welfare Charities and the Animal Health Trust at Newmarket all benefited hugely from his generosity. He even stepped in and rescued Burton Albion when it was facing financial ruin. Sir Stanley achieved his deepest private aspiration towards the end of his life by gaining ownership of Dunstall Hall for £4.5 million and fully restored it (which was featured on Channel Five TV). His plan for Dunstall Hall was not only to make it his residence, but also to turn the dilapidated estate into a prestigious conference venue to ensure its ongoing survival. Having already been awarded an OBE in 1990, Sir Stanley was knighted in 2001 and was soon afterwards, elevated to High Sheriff of Staffordshire. Very sadly, soon afterwards, he was diagnosed with cancer. After battling determinedly, he died on 19th September 2004. From his humble beginnings, St Modwen’s Properties plc was by then valued at around £268 million.